At the Tenderloin headquarters of homeless youth nonprofit Larkin Street Youth Services, excitement about the new "Rising Up" campaign is palpable. The campaign aims to get homeless people aged 18 to 24 off the streets of San Francisco by providing temporary housing subsidies and job placements. "We're going to make sure that it is unacceptable to have young people sleeping on our streets in this city ever again," said Larkin Street Executive Director Sherilyn Adams at the campaign launch this week. Mayor London Breed was also in attendance. 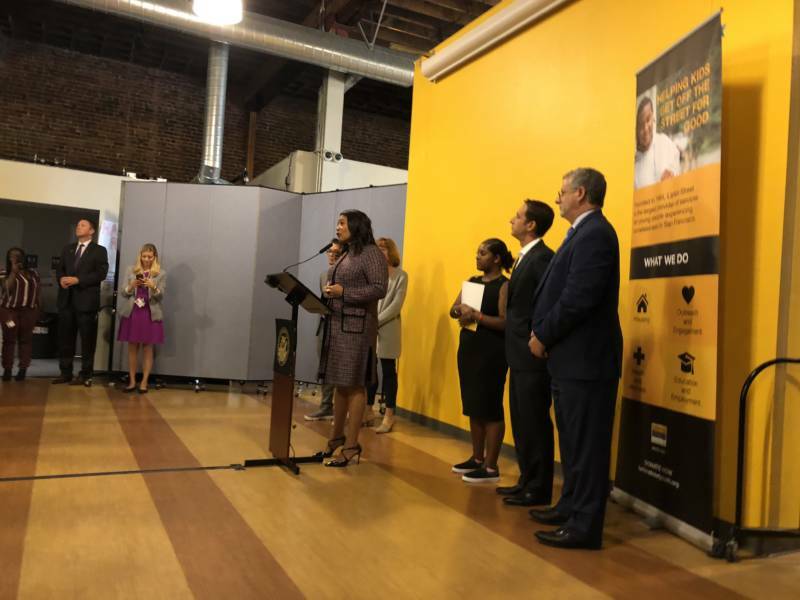 Adams' organization is one of several nonprofits working alongside the city of San Francisco and corporate partners on the $22 million "Rising Up" initiative. With the city contributing $6 million in public funds to the effort, supporters say "Rising Up" will provide crucial assistance in a city where more than a thousand young people regularly sleep outdoors each night. But the new campaign is drawing mixed reactions from nonprofits that work in the youth homeless services space. 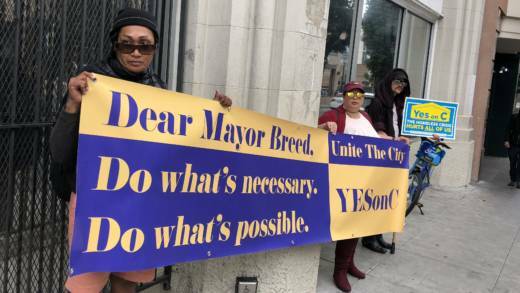 Outside the Larkin Street Youth Services building, a handful of protesters wave big yellow and blue “Yes on C” banners and chant, "Hey Hey Mayor Breed! Unite this City! Yes on C!" 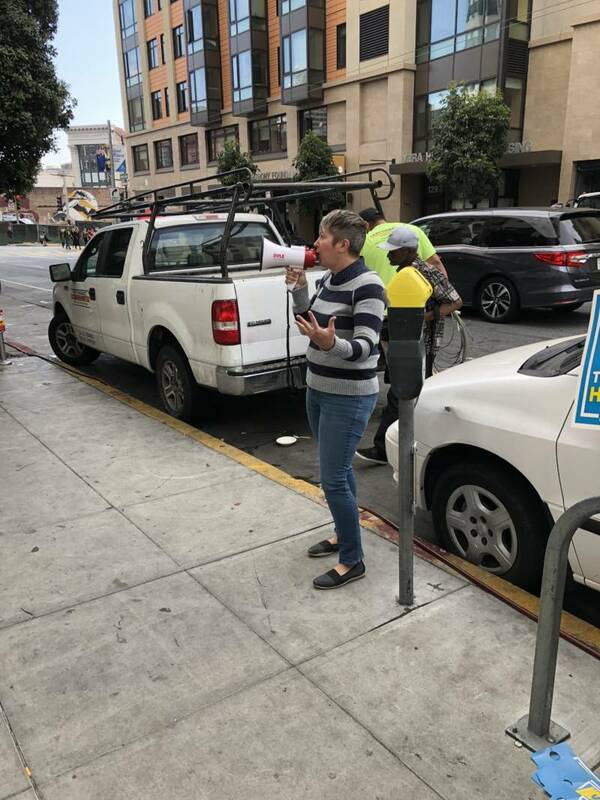 Amy Farah Weiss, who was rallying passersby with a bullhorn, is the founder and director of the homeless nonprofit Saint Francis Challenge. Weiss said the city should focus on rallying voters around Proposition C, a measure on the November ballot which seeks to tax corporations as a way to fund homeless relief efforts. "We have the funding and resources through Prop. C to address this comprehensively," Weiss said. "We don't need a piecemeal approach." Other nonprofit leaders, like Jennifer Friedenbach, executive director of the Coalition On Homelessness, agree. She's excited about the initiative. But she said "Rising Up" should be thought of as an interim investment — a stop gap rather than a long-term solution to the problem of youth homelessness. "We need to have permanent housing to ensure that as more youth become homeless, they have a safe and decent place to call home," Friedenbach says. "Rising Up" administrators say they intend to start placing people in housing within a couple of months.